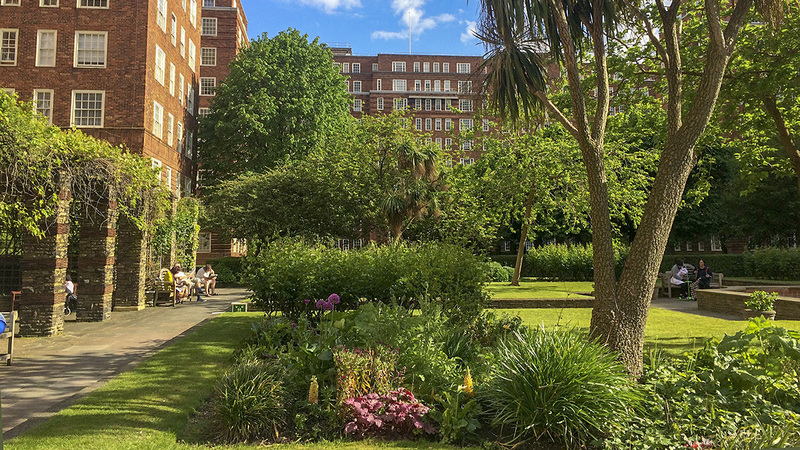 Located beside the River Thames in the Pimlico area of central London, the Dolphin Square apartment complex was built by the U.K. construction firm Richard Costain & Sons, Ltd., in 1935 and designed by architect Gordon Jeeves. 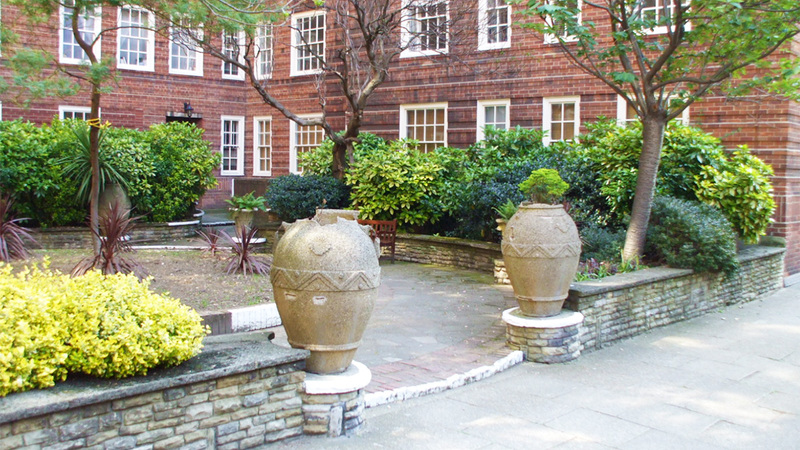 The ten-story, brick-faced building comprises more than 1,200 apartments that enclose a 2.5-acre courtyard designed by the influential landscape architect Richard Sudell in 1936 and completed in 1938. 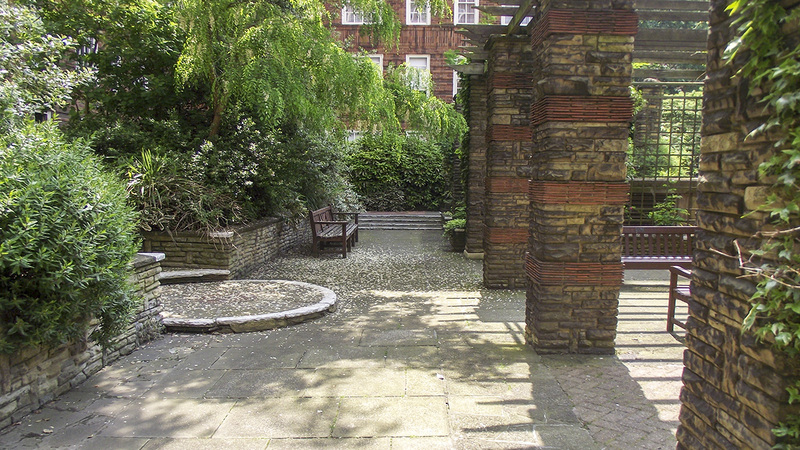 Much of the courtyard is technically a roof garden constructed atop a basement garage. It comprises three primary landscapes, each formally designed with a different character and function and arranged in sequence along a central north-south axis. At the south, a large, open lawn is framed by a privet hedge and evenly divided by a wide, axial pathway lined with horse chestnuts. 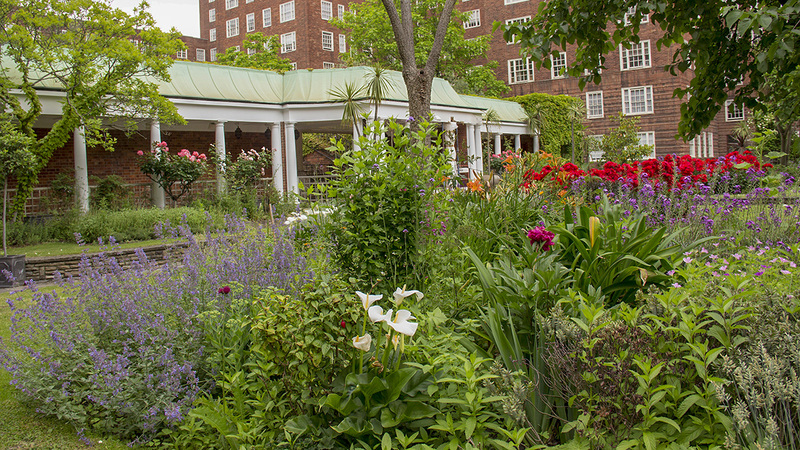 The pathway leads north to the Fountain Garden, the second formal space in the sequence, which contains four raised lawns and rose beds outlined by paving, all disposed around a central pool and fountain. 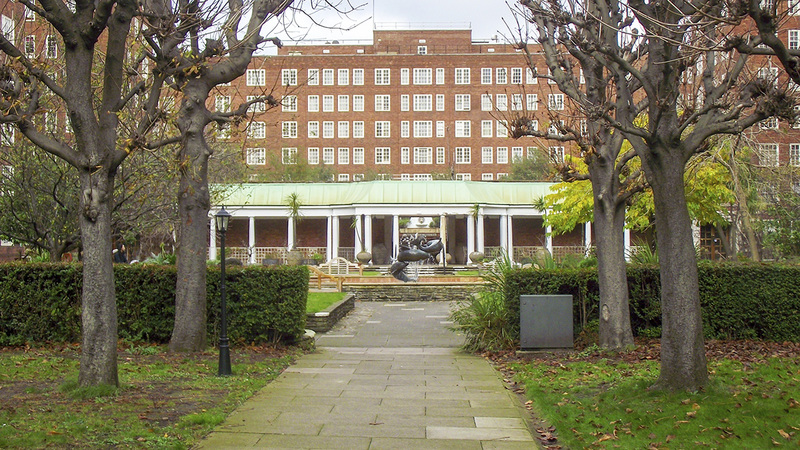 This gives way, farther north, to a raised loggia where a flight of stairs leads to the terra cotta-paved Spanish Garden atop the roof of the complex’s gymnasium and spa facilities (possibly the first major residential roof garden designed in London). Along the eastern and western perimeter of the interior courtyard are five pairs of bays formed by the projecting spurs of the building, several of which contain ornamental gardens, namely an Italian, Japanese, Dutch, and Old English sunken garden. Myriad large, ornamental concrete pots are placed atop plinths, in walled recesses, and on steps throughout, announcing entrances and further defining spaces. 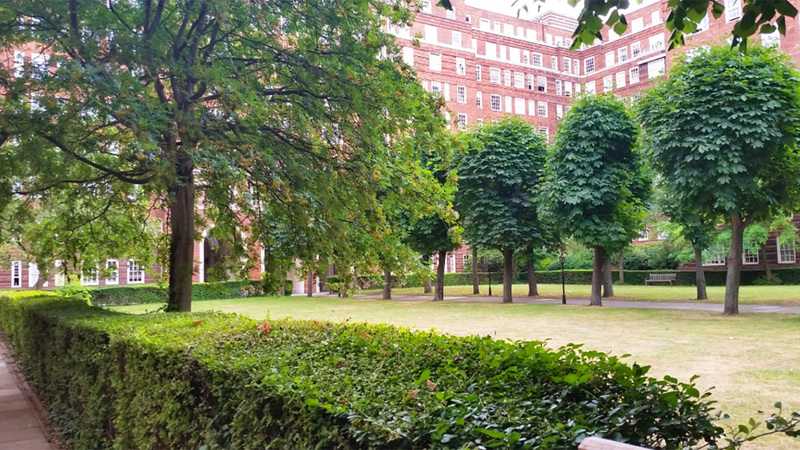 Within three years of completion, the buildings and gardens of Dolphin Square sustained wartime bombing, with repairs effected soon thereafter. 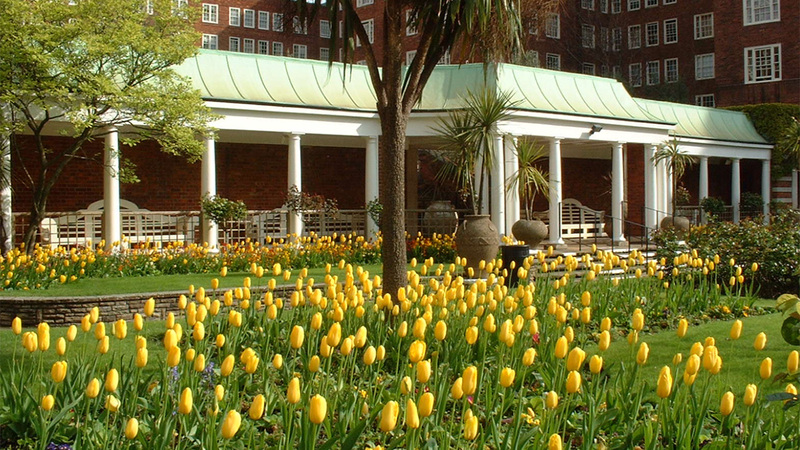 The Spanish Garden was redesigned circa 2000, but retains much of its original character. 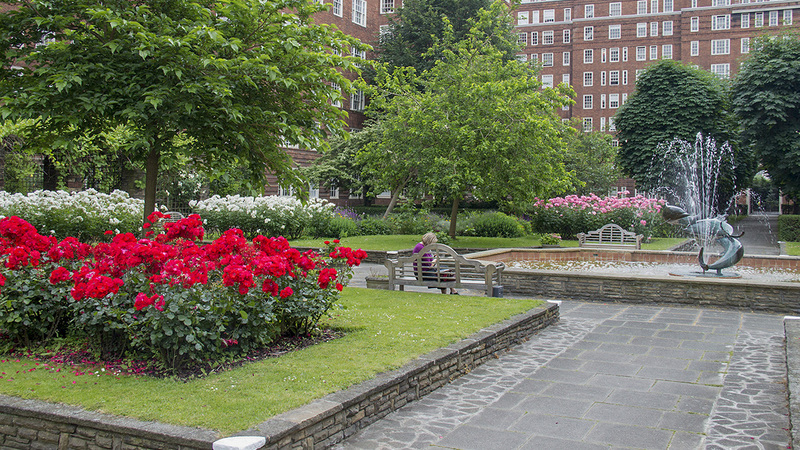 Dolphin Square Gardens was listed as Grade II on the Historic England Register of Parks and Gardens in June 2018, indicating that the landscape is of “special interest” as an historic resource.